I've been desperately trying to have a quiet day as this blog needs a good dose of filler, having become far too birdy. I have a filler post ready to go, but yet again I find that I am unable to use it. I know you are disappointed, but please struggle on through the bird rubbish - I am sure the weather will change and then I can revert back to my usual favourite subjects of moaning, being a self-righteous fuckwit, and so on. Anyhow, the sad news is that I have just this morning added another patch year tick. I got up bright and early to do a quick round of the local water bodies. If there was a Smew on the river, God knows what must be on the various ponds? First stop the Basin. 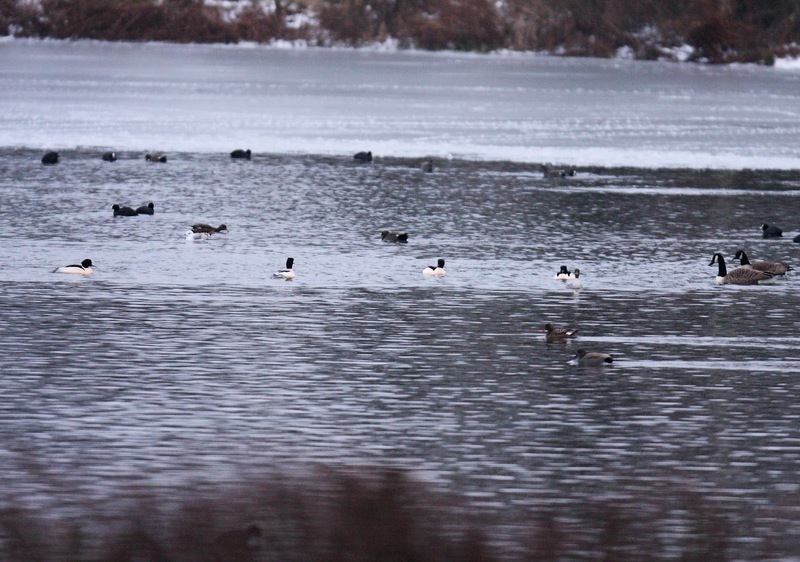 Quick scan left, quite a few Pochard and Tufties (all annoyingly with tufts), and a dodgy farmward-type Goose. Quick scan right, oh more Pochards, loads of Gadwall, a lot of Malla......Gaaaah!!!!!!!!!! Five Goosander! Hell's Bells! 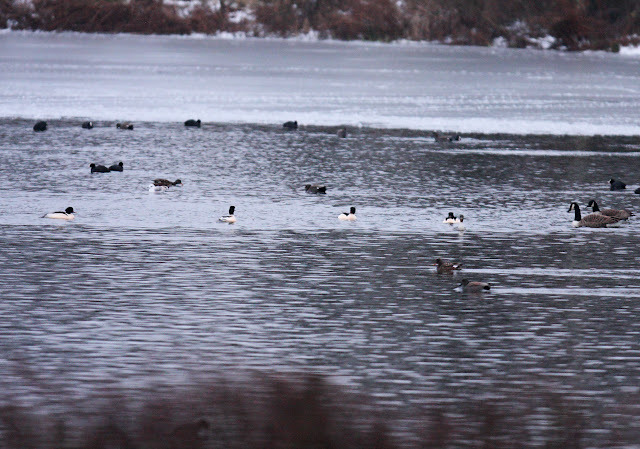 Four drakes and a redhead were brazenly swimming around the edge of the ice, happy as Larry. I very nearly whooped, but I was on a public road and so contained myself. I've seen one Goosander here before, a fly-over on Wanstead Flats a few years ago, so just one would have counted as mega, and instead I get five! This is all becoming too much. I nabbed a few shots just in case they buggered off, and then texted the news out to anyone interested, and quite a few who were probably not. Next time I looked round they were gone. How lucky was that? Not that they flew and I was the only one to have seen them, no no, not at all. I mean, how lucky that I chose to visit in the half hour that they were present? I usually check the Basin after the school run, a full two hours later. I didn't think it made any difference, my assumption being that birds arrive in the night and stay all day. Today I wasn't doing the morning school run, so I was there at first light instead. What a difference a day two hours makes! Needless to say this is the best start to any patch year I've ever had. At this stage in 2011 I had seen 64 species, and in 2010, 68. And there could still be more! No Linnet, no Great Crested Grebe, no Tawny Owl, no Lesserspot. And they're just the regulars - what about a Grey Plover (Nick had Wanstead's first today), or another Goldeneye? There is so much potential excitement that I've decided that you too can join in, via the poll at the top right. Choose which bird you would like me to see next, and I will do my best to make it happen. As I type it's snowing again. What a shame.